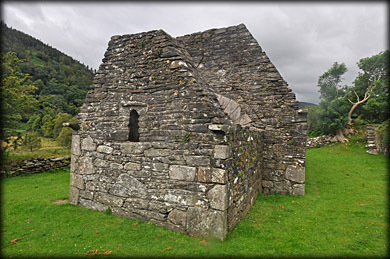 Situated about 250 metres east of the main monastic site at Glendalough is Trinity church. It is a simple 11th/12th century nave and chancel church with a later addition to the west end of the 9 metre long by 5.5 metre wide nave. In the image above we can see the nave on the right with a fine granite arch leading into the smaller 4x3 metre chancel on the left. 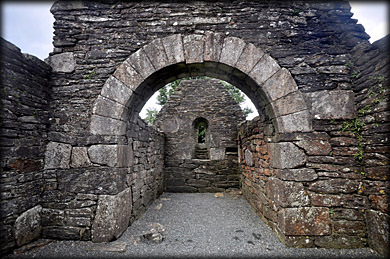 The chancel was lit by the round-headed window in the east wall shown above and a pointed window in the south wall. There are several pointed windows in the south wall of the nave and a couple of round-headed windows in the annexe or sacristy. 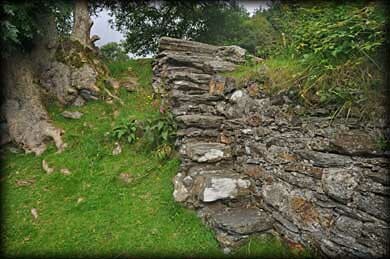 I was delighted to see that the six corbel stones of the original church were still present. These were the supports for the roof. 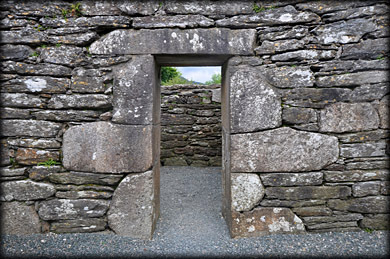 Access to the nave was originally through a wonderful cyclopean doorway with inclined jambs in the west wall. When the sacristy was added later to the west end of the church a round headed doorway was opened in the south wall of the nave. The belfry, see below, was destroyed during a storm in 1818. 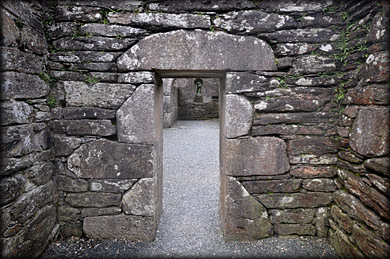 Access to the site is through a wooden style next to the main road, and down series of stone steps pictured at the bottom of the page. The top step is an inscribed slab that has been re-used. 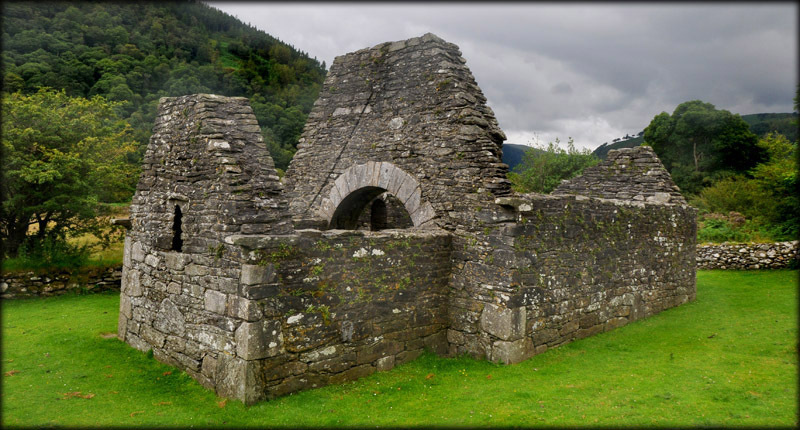 The sacristy was a vaulted room with a belfry attached to the superstructure, similar to the one at St Kevin's Church also at Glendalough. 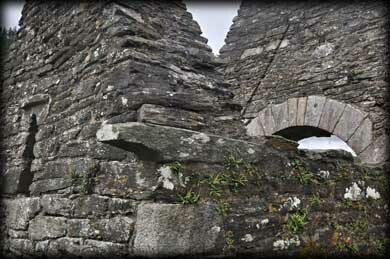 The belfry was destroyed during a storm in 1818, all that remains is part of the springing - the point where the vault comes out from the wall, see image above. In his book on round towers Lalor suggests the engaged towers were a progression from the free-standing towers. 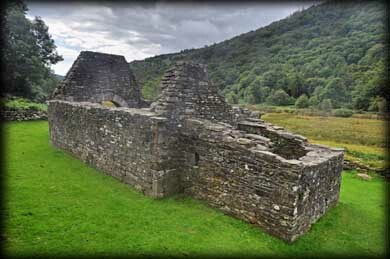 Situated: From the car-park at the main monastic site walk east towards Laragh. On the southside of the road you will see a sign pointing to Trinity Church. Discovery Map 56: T 1273 9684. Last Visited Aug 2012. Dimensions: Height approx 15 metres from the springing. Features: Attached Tower. The sacristy and tower were attached to the church at a later date.